The Horseshoe is a $798 million design-build roadway project to improve traffic flow through the heart of downtown Dallas. Aptly dubbed the “Horseshoe” due to its U shape, construction improvements include the complete rebuilding and reconfiguration of the interchange. Dedicated express lanes from one freeway to the other greatly enhance traffic safety. Interfacing these improvements with the historical Houston Street viaduct required careful planning and attention to detail. Several new connections were provided to enhance connectivity for both highway users and local motorists and pedestrians. 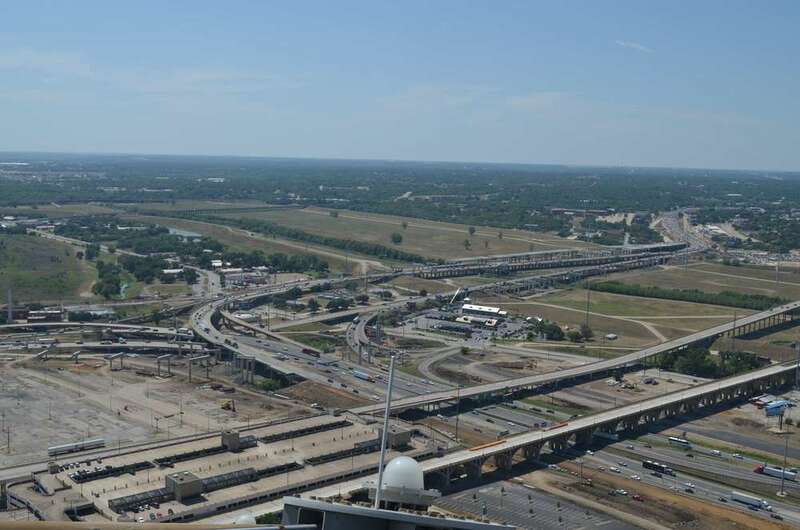 The interchange ranks among the 17 most congested roadways in Texas. More than 460,000 vehicles travel IH 30 and IH 35E every weekday. The original roadways and bridges that cross the Trinity River were mostly constructed between the 1930's and 1950's. At the widest point, the two highways have a total of 23 lanes. Once completed, motorists will experience improved safety, increased capacity and improved mobility. IH 35E river bridges ranking first. Aguirre & Fields developed designs, construction drawings, PS&E, and bridge layouts for ramp bridges 14 and 16, direction connector 10, and pedestrian bridge 18. Bridge 10 was a direct connector from WB IH 30 to SB IH 35E. It consisted of 21 spans with multi-column, single-column, straddle, and special bents, supporting inverted-T bent caps and Tx62 pre-cast beams. The complex foundations ranged from 48" drilled shafts to 4-shaft footings to 72" and 84" monoshafts. Complex horizontal and vertical geometry required several tight turns and multi-level, stacked "portal" bents. Bridge 10 connected to express lanes above the Trinity River and levees. The IH 30 frontage roads were carried across the river by the signature Margaret McDermott bridges designed by the architect Santiago Calatrava.